Basketball fans across the globe are sitting on pins and needles today as the NBA free agent market has opened. Of course, everyone is wondering where LeBron James will land, but there are quite a few others on our watch, too. Dwyane Wade - will he stay in Miami, or go home to Chicago? Chris Bosh has already said he wants out of Toronto. Where will Amar'e Stoudamire play? Doc Rivers recently decided to stay on as the Celtics head coach, giving the city of Boston a sigh of relief, but will Ray Allen, the sharp-shooting free agent, and Paul Pierce, the marquee player who just opted to become a free agent, stay? The Celtics have a great chance at getting back to the finals with Rajon Rondo and Kevin Garnett already locked in. Some say money will do all the talking, as some teams can offer more than others, and "sign-and-trade" deals are most lucrative. Others say the likelihood of winning a championship is the only concern for guys already sitting on millions. 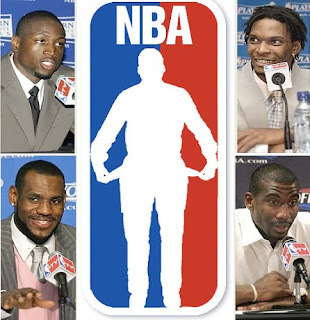 Summer 2010 could change many faces in the NBA. What do you think?